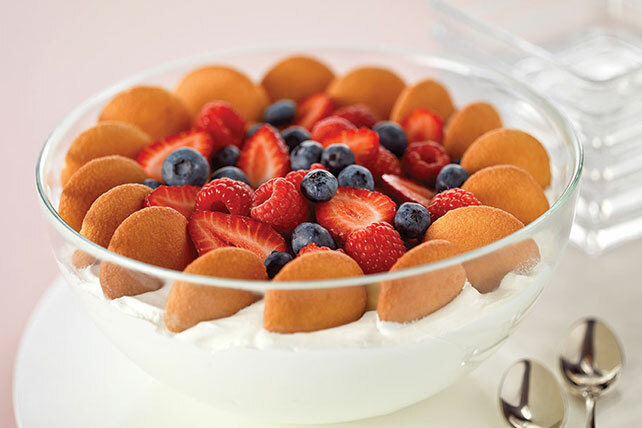 Let kids take turns layering the vanilla pudding, wafers, berries and whipped cream of this creamy trifle recipe, which serves 16. Use back of spoon to spread COOL WHIP onto bottom and up side of 2-1/2-qt. trifle dish or clear glass serving bowl. Gently press 16 wafers into COOL WHIP around side of bowl. Beat pudding mixes and milk with whisk 2 min. Spoon half into prepared trifle dish; top with layers of half each of the remaining wafers and berries. Repeat layers. Refrigerate 3 hours or until wafers begin to soften. Save 50 calories and 3.5 g fat, including 1.5 g sat fat, by preparing with COOL WHIP LITE Whipped Topping, reduced-fat vanilla wafers, 2 pkg. (1.0 oz. each) JELL-O Fat Free Sugar Free Vanilla Instant Pudding and fat-free milk. Prepare using your favorite flavor of JELL-O Instant Pudding. Prepare using your favorite seasonal fresh fruits.